Page Parkes Model + Talent: Oscars 2014! How amazing was this year's Oscars? From pizza ordering to selfies, Ellen Degeneres made it one we will never forget. But before the festivities came the fashion moments we waited all year long for! We were so happy to see how gorgeous some of our Page Parkes alum looked on the most important red carpet event this season. First up is Charlize Theron, who literally stole the spotlight wearing a show-stopping Dior Haute Couture black satin duchess gown. The simplicity of the gown with its exaggerated sweetheart neckline was balanced perfectly with over $15 million worth of diamonds, specifically a 31-carat Harry Winston pendant necklace. We love the fact that she didn't rely on bright colors or over-the-top embellishments to make a statement on the red carpet! Of course, who doesn't recognize this beautiful Page Parkes alum?! Angelina Jolie shocked everyone by saying goodbye to her signature red carpet style. With no thigh high slit or black ensemble in sight, we were still equally as stunned by her neutral and elegant choice. Alongside her husband Brad Pitt, she chose to wear an Elie Saab Haute Couture sheer beaded gown. This soft look along with the details of sparkle is a perfect and unexpected choice for this red carpet queen. How dapper were Channing Tatum and Tyson Beckford last night?! You just can't go wrong with a classic black tuxedo suit! Tyson Beckford was also a co-host for the ABC Red Carpet Special alongside Lara Spencer. We also caught a glimpse of Page Parkes alum Jaime King attending a Pre-Oscars party with gal pal Taylor Swift! Jaime is wearing a beautiful emerald fringe number by Ulyana Sergeenko. Aside from our Page Parkes ladies, who else do you feel made the best dressed list?! There are way too many favorites this year! 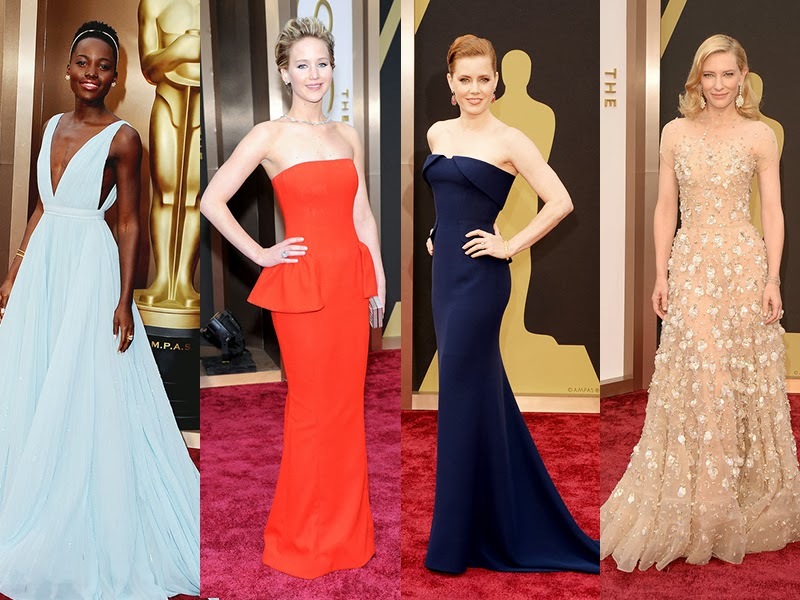 Lupita Nyong'o in Prada, Jennifer Lawrence in Christion Dior, Amy Adams in Gucci, and Cate Blanchett in Giorgio Armani. Kerry Washington in Jason Wu, Kate Hudson in Versace, Anne Hathaway in Gucci, and Lady Gaga in Versace. Congratulations to all of the winners last night and to all of the inspiring actors and actresses out there, keep following your dreams!